This year we actually did the proper German thing with the Christmas tree. OK, it wasn’t intentional. 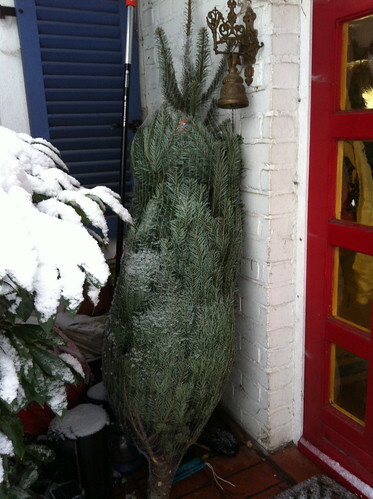 It was because of all the snow that we didn’t go out early and buy a tree. It was the 23rd by the time I managed to scrape the car free of ice and snow and venture out in search of food, last minute presents and a Christmas tree. 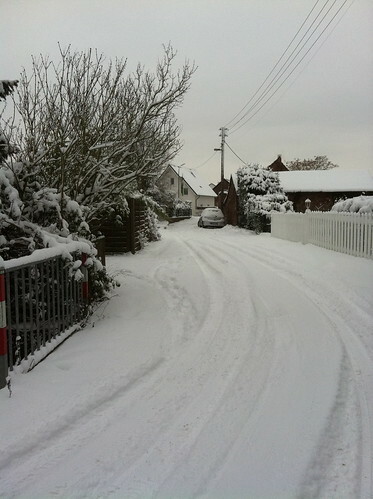 Fortunately the entire German nation had also been holed up in the blizzard, so Christmas trees had not sold out. The tree on arrival was dumped unceremoniously outside the front door where it spent the night. On Christmas Eve we brought the tree inside and decorated it. Had we been proper Germans, of course, we would have risked burning the house down and used proper candles on the tree. Given that our house is made of wood and lined with bookshelves, this didn’t sound like the most sensible idea though, so we stuck to electric lights. Had we been proper Germans, we would have spent the evening sitting round the tree singing “Stille Nacht” and various other traditional Christmas songs. Again, being philistines, in fact although we did gather in the room with the tree, we made our own music which was mainly not particularly Christmassy – although the kids did perform a fabulous jazz version of “Leise rieselt der Schnee” with Dad on piano, son on guitar, youngest daughter on vocals and eldest daughter on the cajon. Glühwein and Kinderpunsch all round. Admittedly with mince pies. Presents definitely not opened on Christmas Eve though. We’re not that German! So what do dachshunds do in this weather, huh? 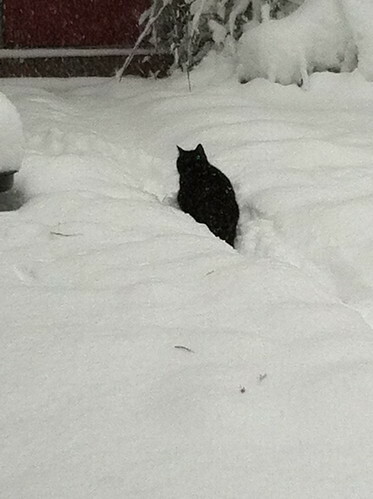 I’ve been watching the cats struggling through the snow (and we have had plenty of new snow overnight), and I am yet again struck by the sheer impracticality of those Germans who choose to keep a dachshund as a pet. If you only have the odd inch or two of snow it’s not too bad. 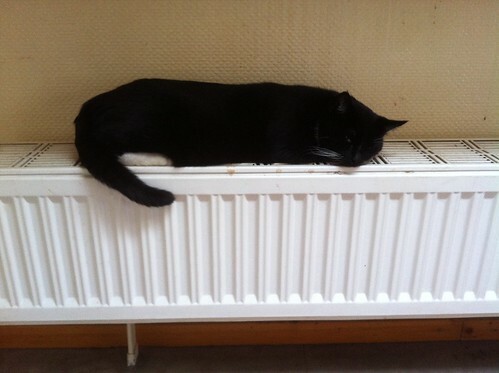 For a cat that’s sort of ankle-deep. For a dachshund that’s already over the knees. I'm getting ice in my armpits Mum! 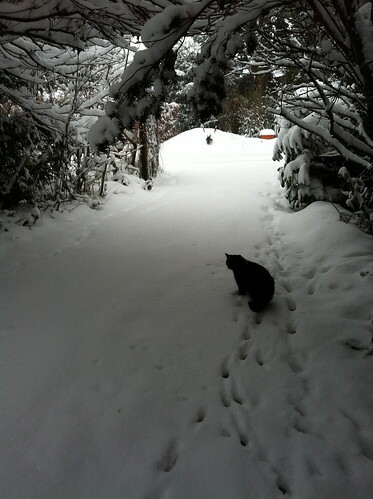 But we’re talking serious snow here… well up to a cat’s shoulders. So what do dachshunds do? Tunnel through it? 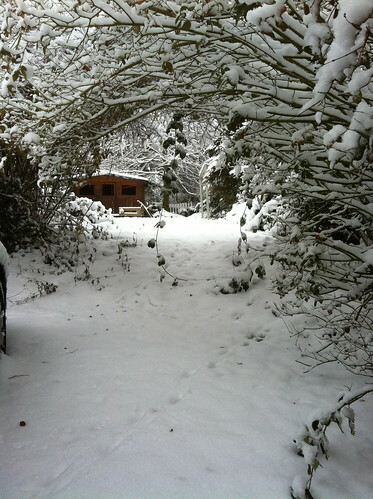 I can tell that I am becoming German though, because this morning, I found myself outside with a shovel clearing paths between all the various doors on our farmhouse. What on earth has got into me? 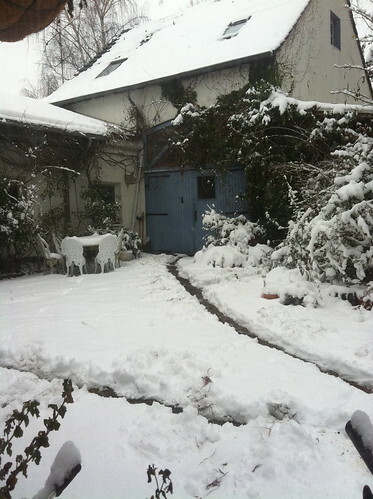 Here are a few pictures of our latest snowscape. 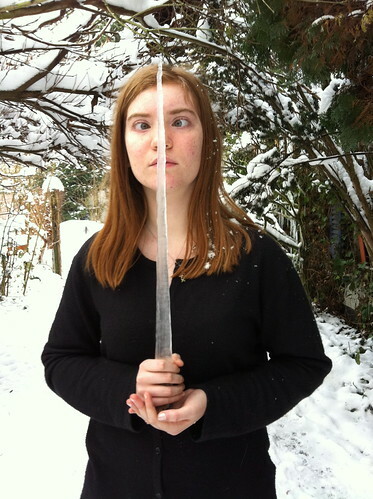 (Minimal) Germanic snow shovelling has taken place. Strangely enough, I can’t seem to interest the cats in this natural beauty at all! Christmas is the time of year when you construct pyramids in your house. I don’t mean a Valley of the Kings stone affair… I mean a wooden one with candles and a windmill on the top. Obviously. 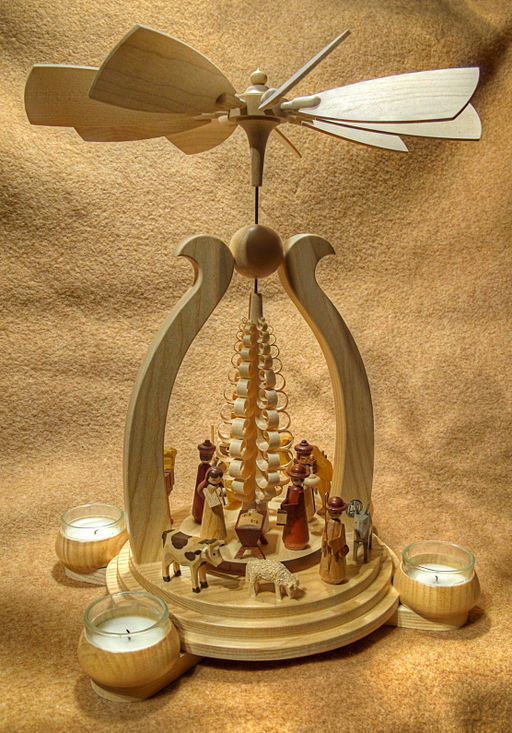 The Christmas pyramid is a sort of Heath-Robinson contraption which uses the convection current of hot air from candles to power a windmill and spin the pyramid. 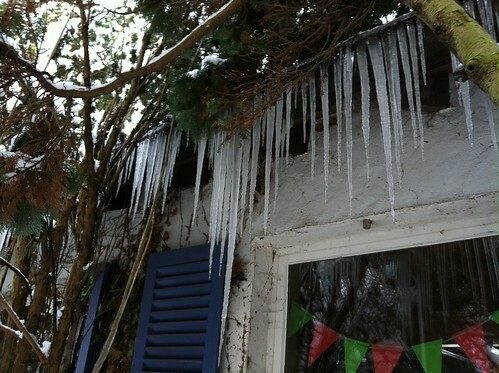 Unlike most other German inventions, this one has absolutely no practical purpose. None whatsoever. Most German homes are content with a small table-top affair these days. 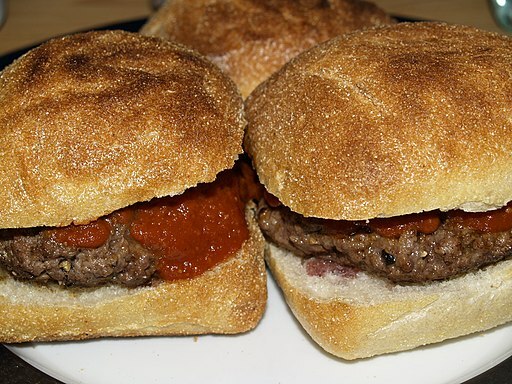 Something that looks like this. 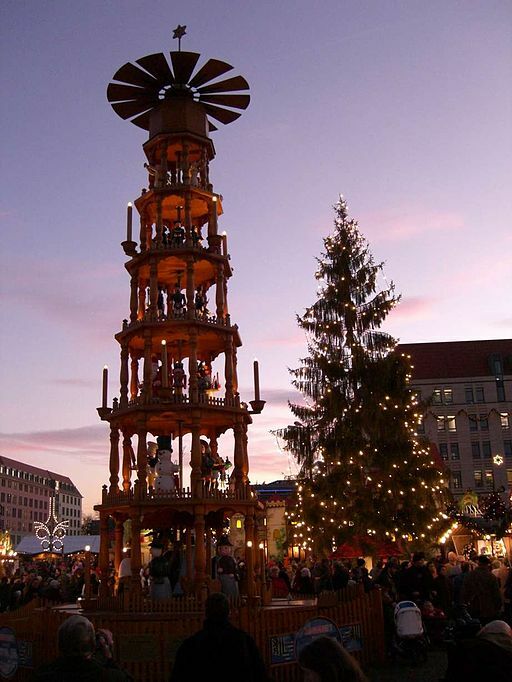 German towns and cities tend to build rather grander versions – often displayed at the local Christmas market. The figures on the different tiers of the pyramids rotate, to indicate to people that they have drunk rather more Glühwein than is good for them. Or something. Originally these decorative carved pyramids date from the middle ages and symbolise light driving away darkness at Christmas time (literally and figuratively). 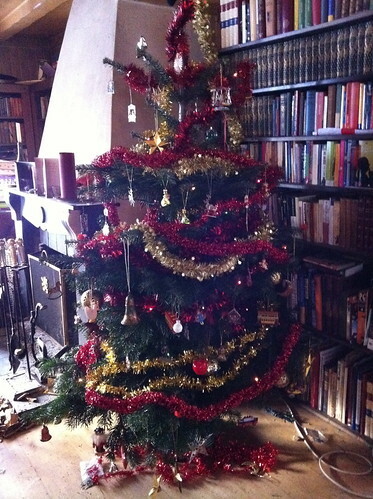 They pre-date the Christmas tree, which became a more popular decoration – probably due to it being easier to chop down a tree and bring it into the house than to spend months whittling away carving a wooden Christmas pyramid. Many Germans still use real candles to illuminate their Christmas trees – at the annual risk of burning the house down, of course. What is it about Christmas that suddenly makes an otherwise sensible nation forget about Vorsprung durch Technik? 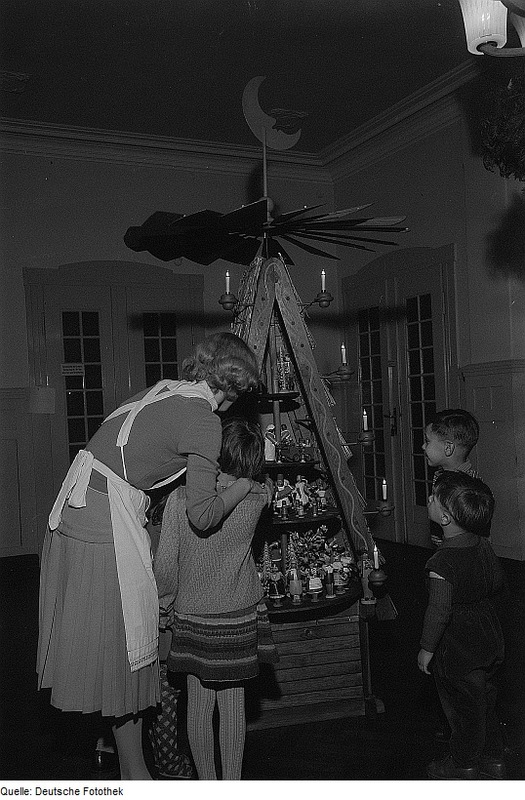 In the old days families would add to their collection of wooden figures in the Christmas pyramid every year, in the same way that nowadays people buy a few new baubles for the Christmas tree. For those who are trying to decide between a real or an artificial Christmas tree this year – a Christmas Pyramid could be the most amazing artificial tree you ever bought! Alternatively, if you start carving now, you might have your very own pyramid ready for Christmas 2011…. It’s mid Advent in Germany, the Christmas markets are in full swing. And a worrying annual phenomenon is becoming apparent. 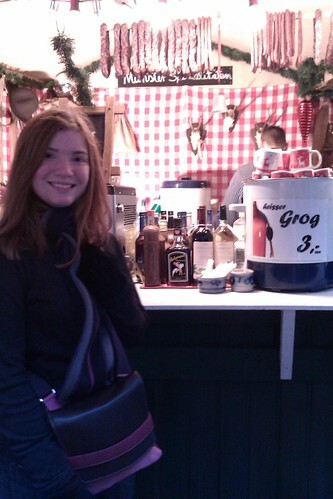 The more Glühwein people drink, the worse their fashion sense becomes. It all starts out quite innocuously. 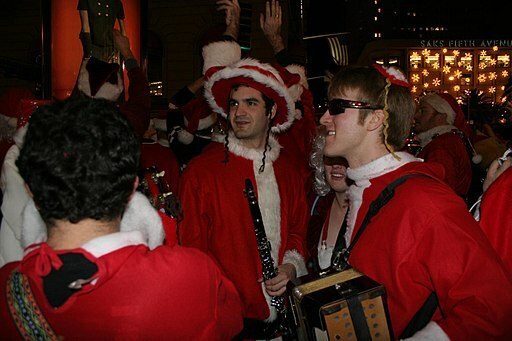 At the start of Advent, Germans look relatively similar to their all-year-round selves. They typically dress in a sensible, sober and sometimes even quite stylish fashion. Step away from the Grog! After a Glühwein or two, possibly an Eierpunsch or a Grog, or even a dip into the Feuerzangenbowle… strange things start to happen. The first and most catastrophic is a total loss of fashion sense. Under normal circumstances, this might not be a problem. But a Christmas market is packed with unscrupulous vendors of dubious fashion-wares, waiting to pounce. Before the unsuspecting drinker knows it, they have blasted their entire Christmas budget on a range of ethnic knitwear, jewellery handcrafted from old tin cans and a tinsel Christmas-tree shaped hat to top it all. By late in the evening, Santa hats are de rigeur, along with strange colourful scarves and jackets which may once have hung as curtains in someone’s kitchen. The cluster of raucous revellers is oblivious to the fashion crimes which they are committing. They are only focused on the next Glühwein and whether the stall selling rainbow fingerless gloves with the tassels is still open. So this advent, I’d just like to issue a sincere warning to all revellers. However tempting it may be…whatever you do… please, think of the children… just don’t drink and shop! Every time you do, a kitten dies….